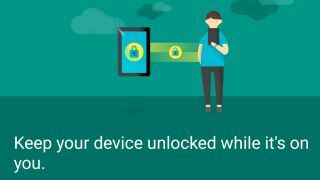 Google has introduced a new feature within the latest Android update which lets users keep their device unlocked while it's still on their person. Android's on-body unlock feature means when you've unlocked your smartphone there's no need to enter in your pin or password to unlock it again, as long as you haven't placed it down. To enable the feature you're likely to find it under the Settings if your device is running Android 5.0 or up, but it isn't currently available on all devices. Using the phone's accelerometer, this seems to be a step toward Android tackling the Apple iPhone's fingerprint sensor that unlocks the device at the touch of a… well, finger. Android doesn't have the luxury of a fingerprint sensor as all the OEMs are at work on different handsets with no guarantee of physical hardware being available on them all. We're going to have a play around with the new feature but we still have a few reservations about whether it's a good idea. Handing the phone quickly to a friend isn't going to break the feature, meaning it isn't entirely secure, especially if it's stolen while unlocked. That said, the feature is designed mainly for convenience and isn't really for those who have a big interest in security - it'll be interesting to see how many people activate the new feature on their smartphones. Take a look at our review of Android Lollipop here.